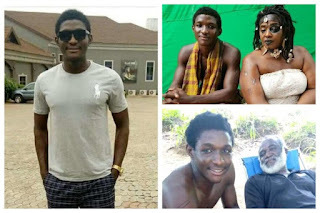 Fast rising Nollywood actor, Ezeora Nelson Oluchukwu aka Nelson Gold, has died on a movie location, just 10 days after celebrating his 26th birthday. It was learnt that Nelson Gold, who celebrated his birthday on June 5th 2018, slumped in a movie location in Enugu State and was rushed to the hospital where he was in coma after which he was reported dead yesterday, 15th June 2018. Nelson Gold, a graduate of University of Nigeria, Nsukka, was a talented Nigerian Actor and Screen writer who broke into Nollywood after playing a lead role in a movie titled “Black Child”, where he stared alongside top notch actors like Ebele Okaro, Obi Okoli, Zulu Adigwe, Chiege Asiligwe, Destiny Etiko, and Vals Chucks. The Movie Black Child lunched Nelson into the mainstream after being produced in Nigeria by JP Nwanganga. It made Nollywood producers to nickname Nelson the “Nollywood’s Mad Actor” following the mind blowing performance he displayed in the movie. Friends, family and fans had since taken to social media to express their sadness at the demise of such a talented young actor. This sad report is coming a month after popular Nollywood actress Aisha Abimbola died, her demise was made known in and Instagram post by her colleague, Actress Bisola Badmus.